A fun and bold black 8mm puck with Swarovski Crystals. 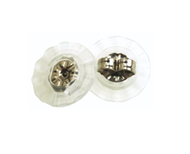 The earrings are set in the safest metal, medical grade titanium. Developed in consultation with skin specialists, these earrings are proven to be skin friendly!